There was a time when people complained about losing their hair once they’ve hit their 50’s or 60’s. But today, age is just a number. People belonging to age groups like late 20’s, early 30’s and 40’s complain how they are facing hair loss issue. Stress, tension, and increasing pollution levels are some of the common factors that lead to hair loss at an early stage. This results in lower confidence levels and losing the ability to stand strong while being a part of the crowd. To find an anchor for themselves, people turn to hair transplantation clinics as their only hope. And it is true, hair treatment centers have become a source for individuals that restores their confidence. Shouldering such a responsibility isn’t easy for a hair loss clinic. But they’ve also got to keep a track of various marketing strategies that help them reach their target audience effectively. Therefore, if you run a hair transplantation clinic, address the pain points of the individuals while marketing your business in market. But first, let’s understand how marketing strategies have changed in 2018. Don’t want people to abandon your site? No business can afford that. But they still do if your site asks these visitors to disable ad blocker manually. According to a study by PaigeFair, 74% people abandon a site if site users are asked to disable the ad blocker. Understand this, people like their privacy and a browsing experience free from ads. As visuals are becoming popular on the net, companies in 2018 have made this a primary tool for communication. They are becoming popular as website visitors engage more through visuals. Creating landing pages that are personalized and speak directly with the customer should be bridged with every one of your advertising campaigns. Understand that the attention your pages garner will convert into currency. And in 2018, it is crucial to build personalized connection with prospects. 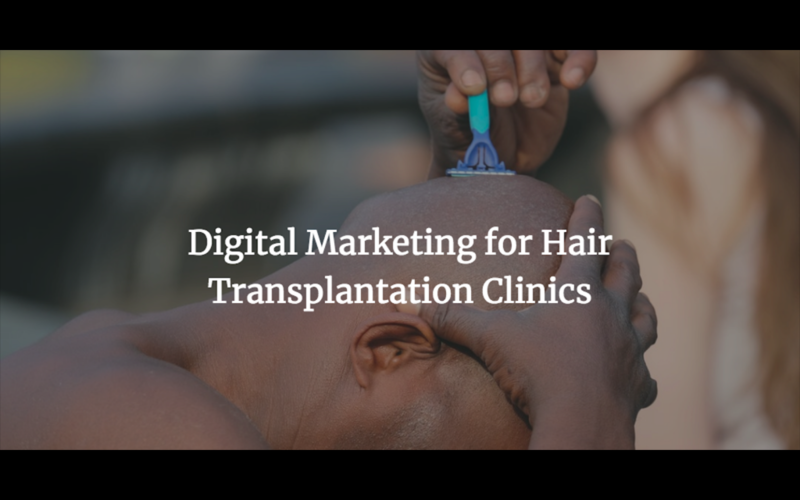 These are just some of the many changes hair transplantation clinics can come across in marketing strategies. But there are certain problems that these clinics face every now and then. One of the prominent issues is how people come across different and confusing information that leads them into taking no decision at all. Reading to what experts or people who’ve already experienced being at one transplantation clinic helps others make an affirmative decision. If someone’s come across your website, they are sure to checkout the reviews left by others who’ve experienced your services at the clinic. This is a recent source that people refer to before visiting a physical clinic. In-depth videos that explain the procedure at your clinic are more likely to help people clear out their confusion. Visiting your website is not only about reading your service pages in detail. People come to see the case studies that help them assess the before and after results after a person has went through the hair transplantation process at your clinic. By this, many people receive help to make a decision. … Your clinic does not hold a monopoly in the market. People can come across various options through these sources to visit any clinic that they find best. So how do you grab their attention? A lot depends on your website’s ranking. You need to make sure that you rank above your competitors to gain better visibility online. In fact, a study by HubSpot suggests that 61% marketers believe that improved SEO and increased organic presence are their top marketing priorities this 2018. So to tackle the competition effectively, hair loss clinics can either opt for SEO marketing strategy or Google ads. While SEO strategies can take time yet are considered appropriate to achieve long term results, Google ads will help them get more leads and conversions easily. While one strategy may take time to reflect results, the later is known for its quick results. Therefore, think fast and assess which strategy will bring better results for your clinic. Disclaimer: Becoming active online is essential for your business. In 2019, more than 90% of your target audience can find you on the web. Therefore, taking this seriously is important and you cannot afford to lose an opportunity to miss out on so many people. Your clinic won’t thrive in the competitive market. What should you do in 2018 digitally to stay ahead of your competitors? From quality SEO services to strategic Google ads creation, Facebook ads, Quora brand building, etc. One needs an effective marketing strategies that would set them apart from others in market. What’s more? One should also focus in making sure that his clinic receive online reputation management services that will help tackle negative reviews, if you business has received any. Many think of tackling negative reviews by posting fake reviews online. But that won’t help in the long run. If your clinic is performing well, then getting over bad reviews becomes a piece of cake. And with digital marketing combination, it will be easier for you to showcase your work and reach your target audience effectively. Any business today wants leads through their website. They adopt various strategies that they believe will work in their favor. But many fail to generate leads that match their goal. Except, this is not something that should de-motivate any business owner. Getting leads for your business is no difficult task this 2018. Thanks to the various marketing strategies that help to back this claim. However, it is important that your hair loss clinic business adapts to the various marketing changes to stay at top of the ladder. And to help you accomplish this goal, implementing digital marketing strategies will be a smart decision. To help you further, edigitalmarketing.in is here to tackle the existing competition online through its effective marketing strategies easily.